We actively share our work on ADE prevention and research work, not only in academic research articles, but also in presentations, background papers, and interviews with media outlets. Balka, E., Peddie, D., Small, S.S., Ackerley, C., Trimble, J., & Hohl, C.M. (2018). Barriers to scaling up participatory design interventions in health IT: A case study: Short Paper. In Proceedings of the Participatory Design Conference 2018 (PDC’ 18). Hasselt & Genk, Belgium, August 20-24, 2018. ACM, New York, NY, USA. Hohl, C.M., Partovi, N., Ghement, I., Wickham, M.E., McGrail, K., Reddekopp, L.N., & Sobolev, B. (2017). Impact of early in-hospital medication review by clinical pharmacists on health services utilization. PLOS One. 12(2). Peddie D., Small S., Wickham M., Bailey C., Hohl C.M. and Balka E. (2017). Designing novel health ICTs to support work, not generate it: Five principles. Proceedings of Information Technology and Communications in Health 2017, Victoria, 2017. Retrieved from http://ebooks.iospress.nl/volumearticle/46176. Peddie D., Small S., Ackerley C., Bailey C., Wickham M., Hohl, C.M., Balka, E. (2017). Action ADE: Enabling Cross-setting Communication to Prevent Adverse Drug Events. Companion of the 2017 ACM Conference on Computer Supported Cooperative Work and Social Computing. 279-282. Retrieved from http://dl.acm.org/citation.cfm?id=3026317. Stockton, K.R., Wickham, M.E., Lai, S., Badke, K., Dahri, K., Villanyi, D., Ho, V., & Hohl, C.M. (2017). Incidence of clinically relevant medication errors in the era of electronically prepopulated medication reconciliation forms: A retrospective chart review. CMAJ Open. 5(2): E345-353. Chruscicki, A., Badke, K., Peddie, D., Small, S., Balka, E., & Hohl, C.M. (2016). Pilot-testing an adverse drug event reporting form prior to its implementation in an electronic health record. SpringerPlus. 5: 1764. Peddie, D., Small, S.S., Badke, K., Wickham. M.E., Bailey, C., Chruscicki, A., Ackerley, C., Balka, E., Hohl, C. M. (2016). Designing an Adverse Drug Event Reporting System to Prevent Unintentional Reexposures to Harmful Drugs: Study Protocol for a Multiple Methods Design. JMIR Research Protocols, 5(3), e169. Retrieved from http://www.researchprotocols.org/2016/3/e169. Hohl, C., Balka, E. & Ackerley, C. (2016). Technology to prevent adverse drug events. Quality Matters, 9(1), 32-27. Link. Bailey, C., Peddie, D., Wickam, M. E., Badke, K., Small, S., Doyle-Waters, M. M., Balka, E. & Hohl, C. (2016). Adverse drug event reporting systems – A systematic review. British Journal of Clinical Pharmacology. Retrieved from http://onlinelibrary.wiley.com/doi/10.1111/bcp.12944/abstract. Link. Hohl, C., Lexchin, J. R., & Balka, E. (2015). Can reporting of adverse drug reactions create safer systems while improving health data? CMAJ. Link . Hohl, C., McGrail K., & Sobolev, B.G. (2015). The Effect of Pharmacist-Led Medication Review in High-Risk Emergency Department Patients: Evaluation Protocol of a Quality Improvement Program. CMAJ Open, 3(1):E103-110. Link. Hohl, C., Karpov, A., Redekopp, L., & Staussberg, J. (2014). ICD-10 Codes Used to Identify Adverse Drug Events in Administrative Data: A Systematic Review. Journal of the American Medical Informatics Association, 21(3), 547-557. Link. Hohl, C., Kuramoto L, Rogula B, Yu E, & Sobolev B. (2013). Evaluating adverse drug event reporting in administrative data from emergency departments: a validation study. BMC Health Services Research, 13, 473. Link. Hohl, C., De Lemos, J., & Abu-Laban, R. (2012). Emergency Hospitalizations for Adverse Drug Events. New England Journal of Medicine, 366(9), 858-860. Link. Hohl, C., Yu, E.S., Hunte, G., Brubacher, J.R., Hosseini, F., Argent, C.,…Singer, J. (2012). Clinical Decision Rules to Improve the Detection of Adverse Drug Events in Emergency Department Patients.Academic Emergency Medicine, 19(6), 640-649. Link. Hohl, C. M., Nosyk, B., Kuramoto, L., Zed, P. J., Brubacher, J. R., Abu-Laban, R. B., . . . Sobolev, B. (2011). Outcomes of emergency department patients presenting with adverse drug events. Annals of Emergency Medicine, 58(3), 270-279.e4. Link. Hohl, C., Abu-Laban, R.B., Zed, P.J., Brubacher, J., Tsai, G., Kretz P,…Purssell, R. (2010). Patient-Reported Adverse Drug Related Events to Emergency Department Discharge Prescriptions. Canadian Journal of Emergency Medicine, 12, 331-338. Link. Hohl, C., Zed, P.J., Brubacher, J.R., Abu-Laban, R.B., Loewen, P.S., Purssell, R. (2010). Do Emergency Physicians Attribute Drug-Related Emergency Department Visits to Medication-Related Problems? Annals of Emergency Medicine, 55, 493-502. Link. Hohl, C., Abu-Laban, R.B., Zed, P.J., Sobolev, B., Brubacher, J.R., Tsai, G., …Purssell, R. (2009). Adherence with Emergency Department Discharge Prescriptions. Canadian Journal of Emergency Medicine, 11, 131-137. Link. Zed, P. J., Abu-Laban, R. B., Balen, R. M., Loewen, P. S., Hohl, C. M., Brubacher, J. R., . . . Purssell, R. A. (2008). Incidence, severity and preventability of medication-related visits to the emergency department: A prospective study. Canadian Medical Association Journal, 178(12), 1563-1569. Link. Hohl, C., Robitaille, C., Lord, V., Dankoff, J., Colacone, A., Pham, L., …Afilalo, M. (2005). Emergency Physician Recognition of Adverse Drug Related Events in Elderly Patients Presenting to an Emergency Department. Academic Emergency Medicine, 12, 197-205. Link. Hohl, C. M., Dankoff, J., Colacone, A., & Afilalo, M. (2001). Polypharmacy, adverse drug-related events, and potential adverse drug interactions in elderly patients presenting to an emergency department. Annals of Emergency Medicine, 38(6), 666-671. Link. Ackerley, CA, Hohl, CM, & Balka, E. What goes unsaid? 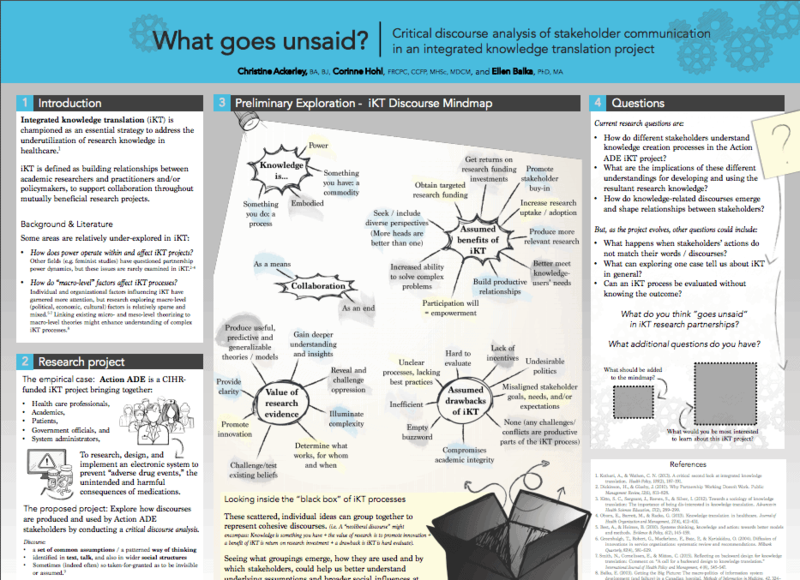 Critical discourse analysis of stakeholders’ communication in an integrated knowledge translation project. Presented at Canadian Knowledge Mobilization Forum, Toronto, Canada. June 28, 2016. (Poster presentation). Link to poster. Small, SS, Peddie, D, Badke, K, Wickham, ME, Bailey, C, Chruscicki, A, Balka, E, & Hohl, CM. 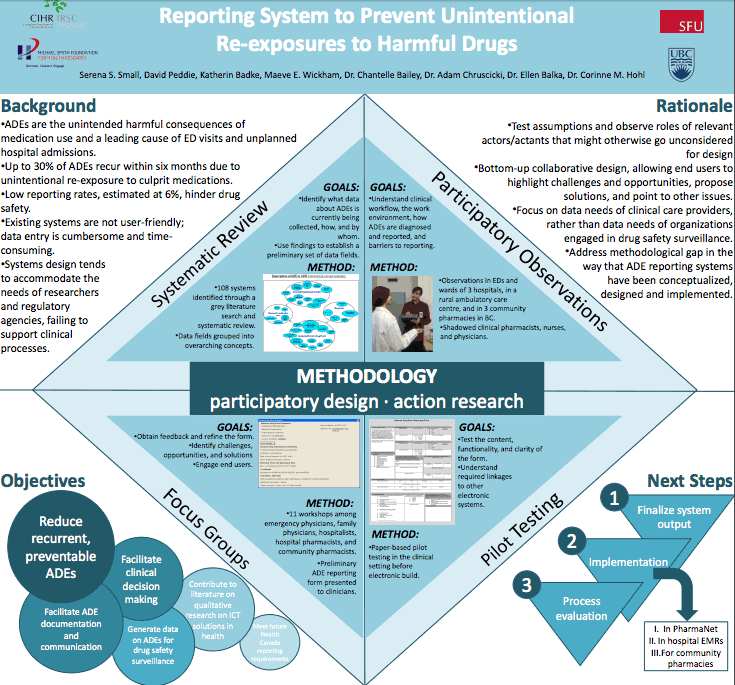 Designing an Adverse Drug Event Reporting System to Prevent Unintentional Re-exposures to Harmful Drugs. Presented at Simon Fraser University Health Research Day, Vancouver, Canada. May 4, 2016. (Poster presentation). Link to poster. Peddie D, Hohl C, Bailey C, Wickham M, Badke K, Small S, Balka, E. Challenges Care Providers Face Documenting Adverse Drug Events: An Observational Study. Quality Forum, Vancouver, BC, 2015. (Poster presentation) Link to poster. Bailey C, Peddie D, Wickham M, Badke K, Lander B, Balka E, Hohl CM. 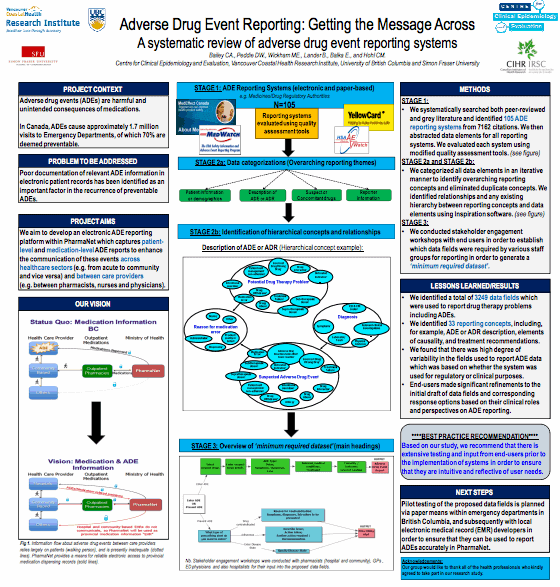 Adverse Drug Event Reporting: Getting the Message Across. BC PSQC Quality Forum 2015. Vancouver, BC 2015 (Poster presentation). Link to poster. Hohl CM, McGrail K, Ghement I, Wickham M, Partovi N, Sobolev BG. Impact Of Pharmacist-­led Medication Review In The Emergency Department On Downstream Health Services Utilization. Canadian Association of Emergency Physicians. 2015 (Oral presentation). Hohl CM, McGrail K, Ghement I, Wickham M, Partovi N, Sobolev BG. Impact Of Pharmacist-­led Medication Review In The Emergency Department On Downstream Health Services Utilization. Society for Academic Emergency Medicine (SAEM) Annual Meeting, San Diego, California, USA, 2015 (Oral presentation). Bailey C, Peddie D, Wickham M, Hohl CM, Balka E. Patients’ roles in reporting adverse drug event in hospitals – Is there a greater need for patient education on medications? Lareb, April 22, 2015 (Oral presentation). Balka E, Hohl CM. 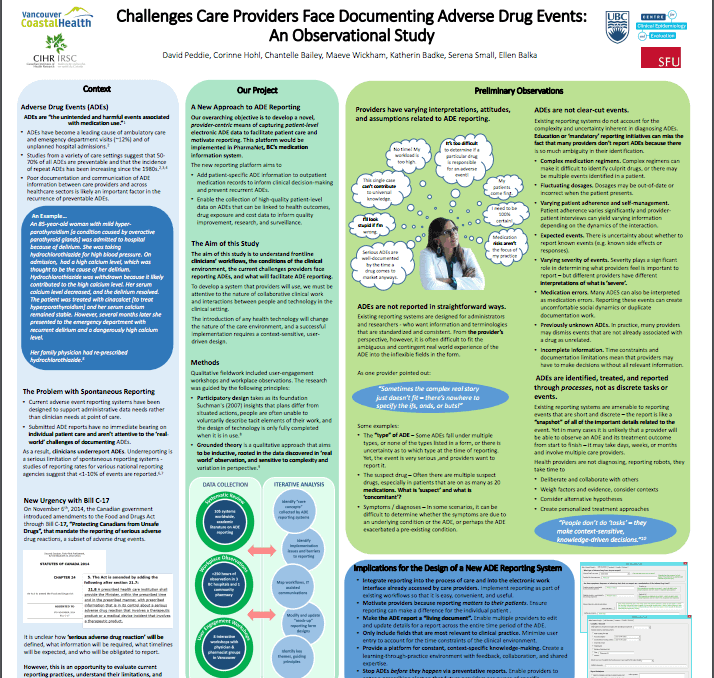 Adverse Drug Events in Context: A Preliminary Overview of Systems Level Issues Influencing Patient Safety. BC PSQC Quality Forum 2015. Vancouver, BC, 2015 (Oral presentation). Hohl CM, McGrail K, Ghement I; Wickham M; Partovi N; Sobolev BG. Does Pharmacist-let Medication Review Improve Health outcomes – evaluation of a quality improvement project. BC PSQC Quality Forum 2015.Vancouver, BC, 2015 (Oral presentation). Karpov A; Mok C; Parcero C; Panditha C; Dempster L; Yu E; Hohl CM. Validation of trigger tools and the National Electronic Injury Surveillance System-Cooperative Adverse Drug Event Surveillance Project (NEISS-CADES) algorithms for identification of adverse drug events within emergency department health records. CAEP Conference, Ottawa, ON. May 31- June 4, 2014 (Plenary Presentation, Top Resident Research Award). CJEM 2014;15(S1):S21. Quinn M, Hunte G, Hohl CM. The role of pharmacists within the context of an emergency department-based adverse drug event screening program. CAEP Conference, Vancouver, BC. June 2-5, 2013 (Poster Presentation). CJEM 2013;15(S1). Hohl CM, Reddekopp LN, Yu E, Rotinsky J, Stang C. Reliability of clinical decision rules to improve the detection of adverse drug events in emergency department patients. CAEP Conference, Vancouver, BC. June 2-5, 2013 (Poster Presentation). CJEM 2013;15(S1). Hohl CM, Reddekopp LN, Yu E, Tsang R, Partovi N. Pharmacist-led medication review in high-risk emergency department patients: a workload estimate. CAEP Conference, Vancouver, BC. June 2-5, 2013 (Poster Presentation). CJEM 2013;15(S1). Hohl CM, Reddekopp LN, Tsang R, Partovi N, Yu E, Coleman J, Karpov A, Campbell D. Feasibility of implementing an adverse drug event screening program in an emergency department. CAEP Conference, Vancouver, BC. June 2-5, 2013 (OralPresentation). CJEM 2013;15(S1). Hohl CM, Kuramoto L, Rogula B, Yu E, Sobolev B. Adverse Drug Event Reports in Administrative Records of Emergency Department Patients. CAEP Conference, Niagara Falls, ON. June 2-5, 2012. (Poster presentation). CJEM 2012; 14 (S1). Hohl CM, Yu ES, Hunte G, Brubacher JR, Hosseini F, Argent C, Chan W, Wiens M, Sheps S, Singer J. Clinical Decision Rules to Improve the Detection of Adverse Drug Events in Emergency Department Patients. CAEP Conference, Niagara Falls, ON. June 2-5, 2012. (Plenary presentation). CJEM 2012; 14 (S1). Hohl CM, Zed PJ, Abu-Laban RB, Brubacher JR & Loewen PS. Comparative Performance of Emergency Physicians and Clinical Pharmacists in Evaluating Patients for Drug-Related ED Visits. Poster presentation at the CAEP, Calgary, AB, June 2009. Hohl CM, Zed PJ, Abu-Laban RB, Brubacher JR, Loewen PS. Emergency Physician Recognition of Drug-Related Visits to the Emergency Department. Poster presentation at CAEP, Calgary, AB, June 2009. Hohl CM, Zed PJ, Abu-Laban RB, Brubacher JR, Loewen PS. Emergency Physician Recognition of Drug-Related Visits to the Emergency Department. Oral presentation at SAEM Conference 2009. Hohl CM, Abu-Laban R, Zed P et al. Patient-Reported Adverse Drug Related Events from Emergency Department Discharge Prescriptions. CAEP, Victoria, BC. June 2007 (oral) Can J of Emerg Med 2007.9(3):193-194. Hohl CM, Abu-Laban R, Zed P et al. Patient-Reported Adverse Drug Related Events from Emergency Department Discharge Prescriptions. SAEM, Chicago IL, USA. May 2007 (poster) Acad Emerg Med. 2007.14(5):S194. Zed PJ, Abu-Laban RB, Balen RM, Loewen PS, Hohl CM et al. Drug-Related Visits to the Emergency Department of a Large Canadian Hospital: A Prospective Study. CAEP, Victoria, BC. June 2007 (oral) Can J of Emerg Med 2007.9(3):194-195. Hohl CM, Robitaille C, Lord V et al. Emergency Physician Recognition of Adverse Drug Related Events in Elderly Patients Presenting to an Emergency Department. CAEP, Montreal, QC. May 2007 (poster) Can J of Emerg Med 2004; 6(3):171. Hohl CM, Robitaille C, Lord V et al. Emergency Physician Recognition of Adverse Drug Related Events in Elderly Patients Presenting to an Emergency Department. SAEM, Orlando, FL, USA. May 2004 (oral) Acad Emerg Med 2004; 11:448. Robitaille C, Lord V, Hohl CM et al. Frequency of adverse drug related events in elderly patients presenting to the emergency department. American Society of Health-System Pharmacists, New Orleans, LA, USA. 2003 (poster). Hohl CM, Robitaille C, Lord V et al. Frequency of adverse drug related events in elderly patients presenting to the emergency department. AMUQ, Quebec, QC. 2003 (oral). Important research is being conducted around the world to better understand how ADEs happen, and how to prevent them. ImagineNation Challenges tasks Canadian researchers to seek answers to important questions about our health and health system. ICES Western’s winning entry is summarized in the infographic below (click to view a larger PDF). To read the full submission, please visit the Data Impact Challenge page here. Every month, we post two research articles related to our research. Topics include ADEs and ADE prevention, technology design, information communication infrastructure, and systems implementation. Bossen, C., & Markussen, R. (2010). Infrastructuring and ordering devices in health care: Medication plans and practices on a hospital ward. Computer Supported Cooperative Work, 19(6), 615–637. Cadogan, C. A., Ryan, C., & Hughes, C. M. (2016). Appropriate Polypharmacy and Medicine Safety: When Many is not Too Many. Drug Safety, 39(2), 109–116. Carleton, B. C., & Smith, M. A. (2006). Drug safety: Side effects and mistakes or adverse reactions. BC Medical Journal, 48(7), 329–333. Dweik, R. Al, Yaya, S., Stacey, D., & Kohen, D. (2016). Spontaneous adverse drug reaction reporting by patients in Canada: a multi-method study-study protocol. SpringerPlus, 5(1), 213. Gagliardi, A. R., Brouwers, M. C., & Bhattacharyya, O. K. (2015). The development of guideline implementation tools: a qualitative study. CMAJ Open, 3(1), E127–33. Melmon, K. L. (1971). Preventable drug reactions—causes and cures. New England Journal of Medicine, 284(24), 1361-1368. Perrow, C. (2011). Normal accidents: Living with high risk technologies. Princeton, NJ: Princeton University Press. Rex, J. H., Turnbull, J. E., Allen, S. J., Vande Voorde, K., & Luther, K. (2000). Systematic root cause analysis of adverse drug events in a tertiary referral hospital. Journal on Quality Improvement, 26(10), 563–575. Swinglehurst, D., Greenhalgh, T., Myall, M., & Russell, J. (2010). Ethnographic study of ICT-supported collaborative work routines in general practice. BMC Health Services Research, 10(1), 348.